The common dream of many people is to have a well-designed walk in closet where accessing the kind of outfit you are interested in wearing for the day or for any occasion becomes easy and effortless. A lot of time is often spent in searching through the closets to get a specific outfit one may be interested in and it can be frustrating at times. 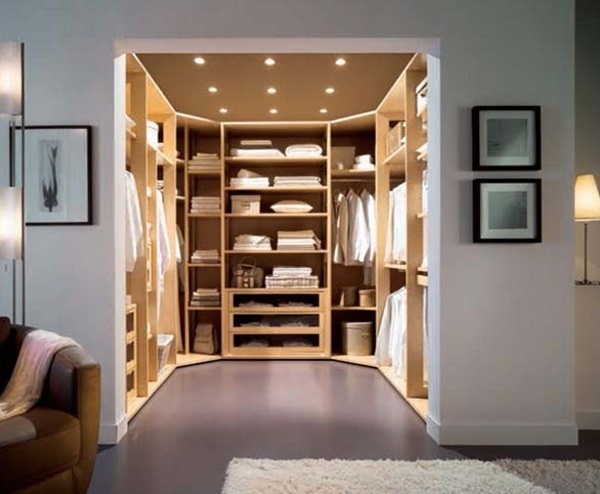 This article provides you with great walk in closet design ideas that you can take advantage of and implement for a more organised life and home. Sometimes we feel that items we store in our wardrobe looks very cramped and it is messed up on the whole but in most of the cases it is in how and where they are stored. Either we need more space to expand our ward robe or should have the mindset to have lesser contents that we store. But most of us especially women have lots of stuff to store in like shoes, handbags, various accessories and all types of robes specific to a variety of activities. There are walk in closet designs ideas that one can take advantage of but this needs a lot of imagination and proper planning to design a perfect walk in closet in your house. 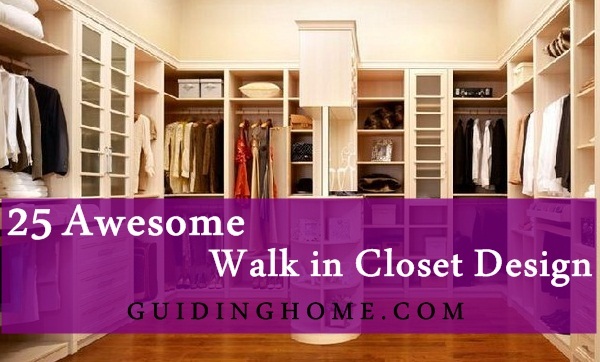 What is a walk in closet? Walk-in closets are storage spaces for your wardrobes that help you to arrange your dress and accessories with a minimum storage space and maximum utility. The purpose of walk-in closet design is to address both the parameters of space constraint and easy access of your dress and other accessories. Here in this walk in closet design, your whole room is made as a wardrobe utilizing every small space. There is a separate plan made to walk in closet design and there are lots of interior decorators specializing this particular requirement. 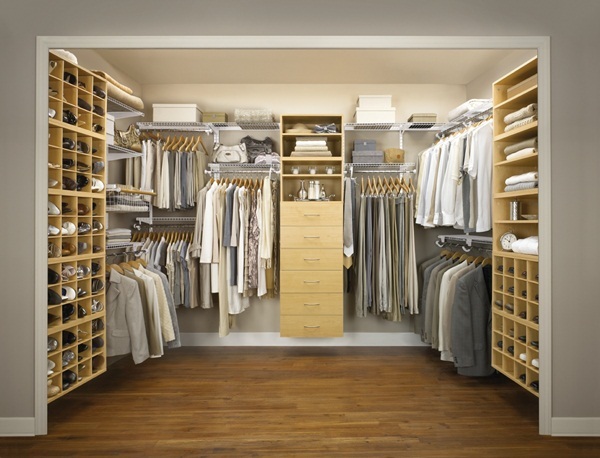 The walk in closet design helps in utilizing each and every corner of your room. 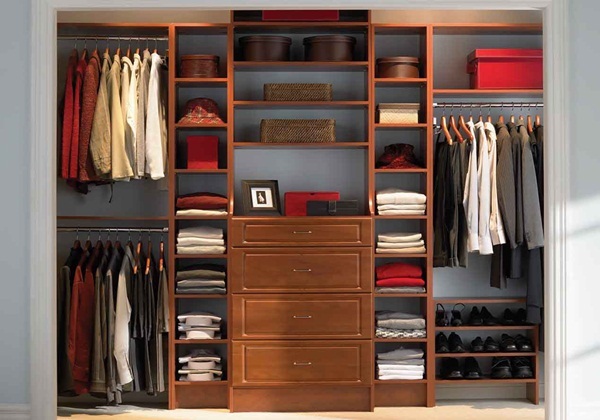 Even a little space in your room can be utilized to keep your wardrobe. Moreover, if you use quality furniture to construct a walk in closet in your room, it can enhance the look of your room. Having your walk in closet incorporated in your master bedroom can be quite convenient and help in managing the clutter that often happens if clothes are not well organized. One of the major factors to consider when designing your walk in closet is carrying out an evaluation of storage needs and the items to be stored in the closet. The walk in closet design below looks properly organized with similar type of clothings well stored in one place making them easy to locate. 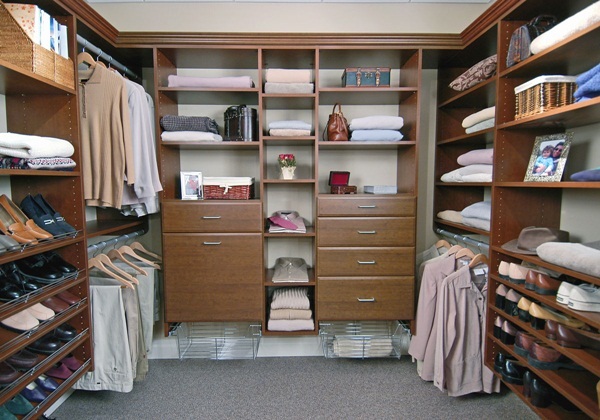 Having a custom built walk in closet is also ideal for efficiency, improved functionality and convenience. The walk in closet below has most of the vital things necessary for a walk in closet. Things like the chair where one can sit while wearing socks and shoes, the full length mirror where you can get to look at self after dressing, and the ironing table. The below walk in closet looks simple and well designed with enough space to hang the clothes and for storing other items. The walk in closet has sufficient drawers and fits well in the room where its positioned next to the living room. Having shallow boxes and tins in the walk in closet provides sufficient storage for the necessary accessories. The walk in closet should be one where items can be clearly located without having to keep turning things upside down. The walk in closet below is spacious enough and is showing all the clothings, shoes and bags clearly where they have been placed. Sufficient lighting is also important as seeing items in the drawers might not be possible without sufficient lighting. How walk in closet makes a difference? Walk in closet design had helped them to utilize the entire wall space into a storage space, thereby putting the maximum space utilization. It is one of the best options to utilize space. Walk in closet design are made in such a way that it provides an airy place to the contents so that certain contents like leather bags and stuff are protected in humid climates. 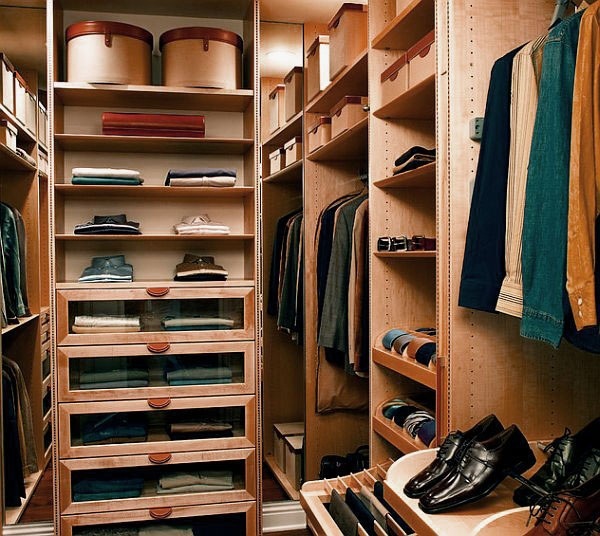 Walk in closet design saves a lot of time in the morning hours to get things intact. 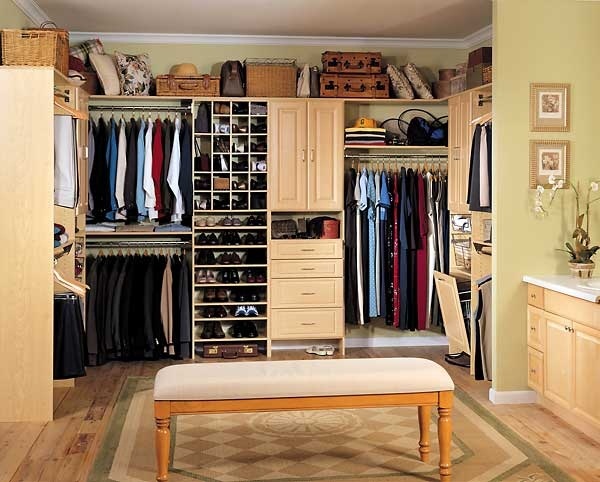 Multiple walk in closets at every corner of your room helps you to manage your wardrobe efficiently and effectively. 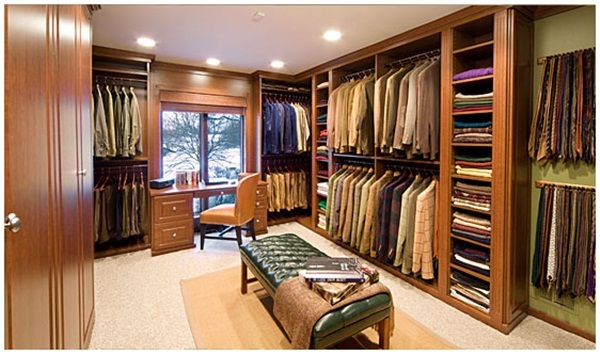 The walk in closet below is an ideal gentleman’s closet with every item well placed.The length of the clothing to stored should be considered to hang it in the place where it fits well. It’s important to make maximum use of the walk in closet and make use of every available space appropriately just like in the walk in closet below. This walk in closet design below looks spectacular with the type of wood used making it look durable and cool. The draws are sufficient enough providing sufficient room for the clothings and other items. The walk in closet below looks well organized and every available space perfectly utilized. The walk in closet below looks well organized like a real clothes store with shoes and other clothings perfectly arranged. For a walk in closet to remain organized its good to be well acquinted with the type of arrangement and where to search when looking for something. The lighting is sufficient making it easy to locate items in the drawers. The walk in closet below looks quite similar to a highend clothes store with all the accessories placed well in its place. The white colour and the customized draws makes the whole design to look elegant. The big draws placed in the middle of the walk in closet looks great for storing jewellery and other valuable personal items. 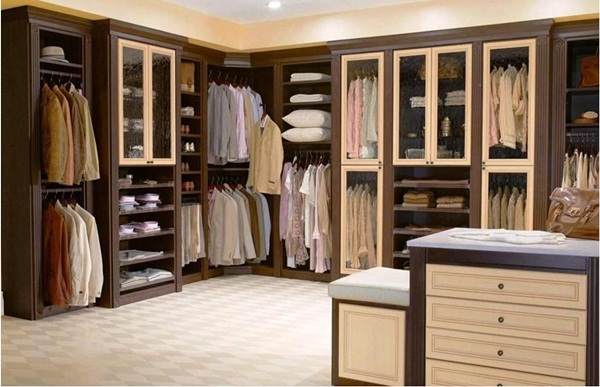 The walk in closet looks very spacious and elegant. The colour of the walls, ceiling board and floor looks perfectly great with sufficient space to hang clothes and store other valuable items. The lighting used is perfect as it illuminates every part of the closet with the colours used enhancing the entire outlook. Here are certain tips that will help you out in designing walk in closet for your room to store your wardrobe and manage it properly. It’s a perfect idea to do this walk in closet design for the bedroom so that the living room is left free. Make the lighting mirror requirements truly lavish so that the closet is super cool to operate. Its good to focus on visibility for your walk in closet designs. Using glass fronted drawers, tie racks and wire bins can help in arranging items well and keeping them in a place where they can be easily seen. 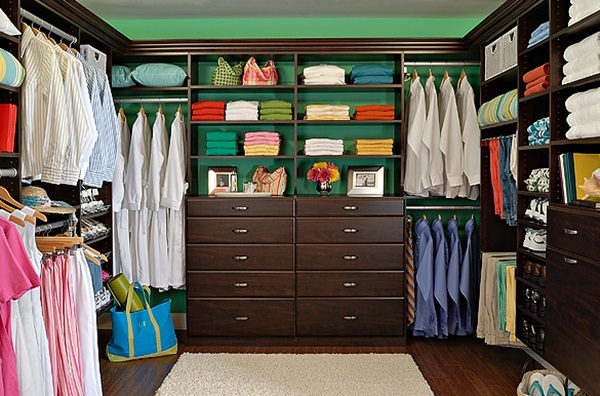 The walk in closet below is well organized with sufficient space to hang the shirts and keep other items.The colour used in the walk in closet also creates a very appealing cool look. The grey colour used on the walk in closet walls and the white colour of the drawers blends perfectly well as it highlights the look of the closet. The items are well organized with the cloths hanged within sufficient space as in the design below. The colours of the carpet also adds on the actual outlook and enhances on the general outlook of the walk in closet design. The type of finishing used on this walk in closet shows an ideal gentleman’s taste with the theme of the entire walk in closet feeling great. Every item in the closet looks spectacular and well placed within the closet. The storage cans matches well with the entire walk in closet creating such a classy design. The walk in closet designs is an ideal lady’s closet with the numerous pairs of shoes well arranged for easy visibility.The colour of the walk in closet design helps in highlighting the clothes and shoes outlook and requires just little lighting to create more brightness for enhanced visibility. The apt thing is to utilize the dressing area of the room for walk in closets design. It’s all yours. You can enjoy every little space of the room to make this a perfect one. At the end of the day, you will feel like the utility is so fabulous. You can also consult with people offering creative plans at a minimal fee. This design works too well in homes where very big wardrobes cannot be made. 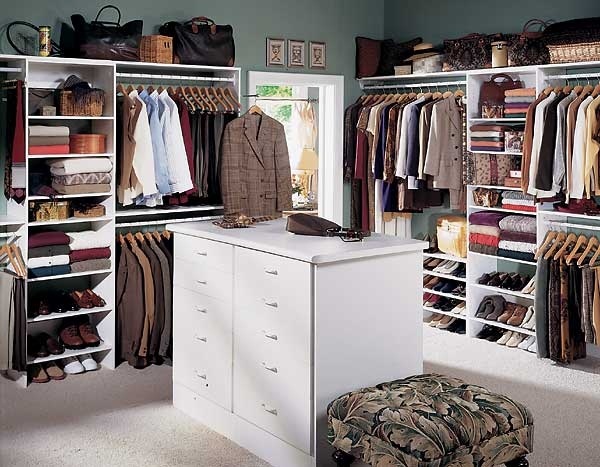 Of all, walk in closet design is very inexpensive. Walk in closet designs just like any other room require sufficient airflow to prevent the place from being stuffy and providing a conducive environment for growth of mould and other still air breeders. The space provided in between items in the walk in closet below provides an ideal room for air to flow and circulate efficiently. The colour used on the floor and ceiling board makes the items to blend well. The way items are stored in the walk in closets design also provides some element of order and convenience when searching for the materials. The green colour used on the background wall blends perfectly well with the clothes and other items in the walk in closet. Its good to have a basket in the walk in closet where some items like the slippers can be stored instead of living the items hanging lose on the floor. Keeping your clothes and accessories in an organized manner can be quite appealing and frees one of time that can be wasted in locating what to wear. The walk in closet below is very well organized and the storage drawers have been sufficiently utilised. The type of wood used for the walk in store looks good quality and blends well with the ceiling board and floor colour. There are numerous options that one can explore for fitting and designing your closet. Use of poles, shelves and hooks in walk in closet helps in keeping the clothings in a convenient manner where the items can be easily reached and used.The walk in closet design below looks great with the colour themes making the closet look brigher with enhanced visibility. This is a perfect arrangement for shirts of same colours, and designs in one place, same colours and similar items in the same place. 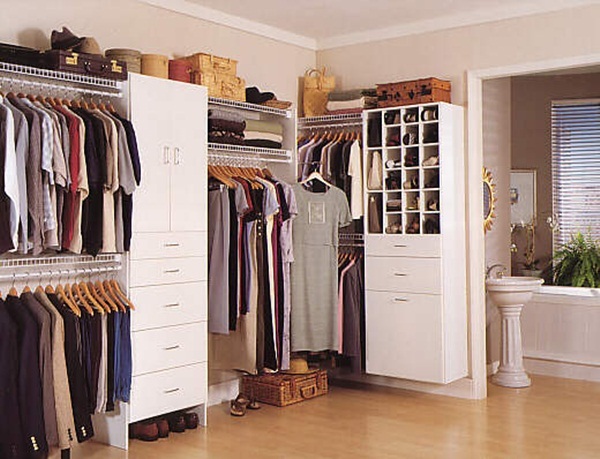 The arrangement style of the walk in closets design below makes it easy to locate the type of item required. One can have a well deigned walk in closet without having to spend huge sums of money. Instead of using wood all through, the closet can be designed in such a way that the wall is used as part of the walk in design instead. 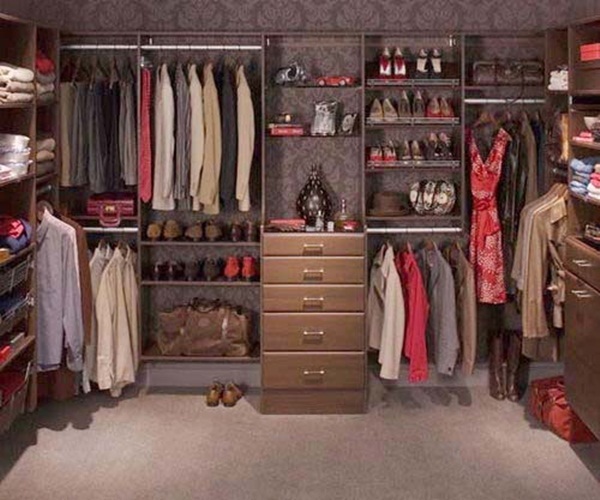 The walk in closet design below looks great with the draws customized to fit the specific items stored like the shoes, the shirts, courts and other items. The boxes and drawers provides storage for any other item leaving the closet looking clean. 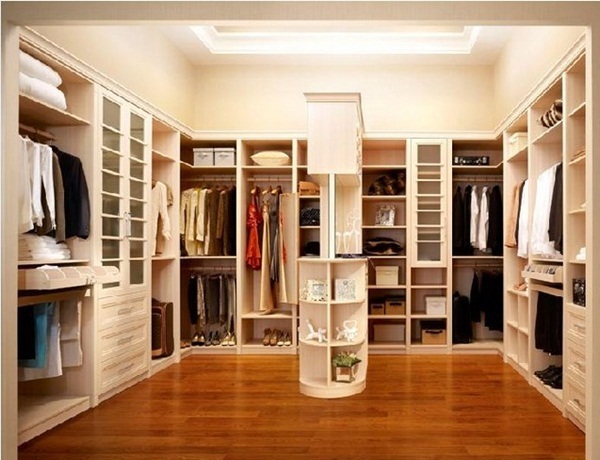 The sleek walk in closet designs below has such a boatique feel with everything stored in a perfect place. The wall and drawers colour of the walk in closet creates such a warm atmosphere in the closet making it look entirely elegant and classic. The ladder also help in reaching out to items that are placed at a higher position making it quite convenient. The walk in closet designs below looks spectacular with the large full length mirror giving the closet such a lavish look. The place the walk in closet is situated within the house is also important as one needs convenience when operating from the bedroom to the living room and the bathroom. The walk in closet below has sufficient lighting with the neutral colours of the room creating a cool feeling in the closet. So, designing a walk in closet at corners of your room is a great option. These walk in closets had become the necessity of small space houses. 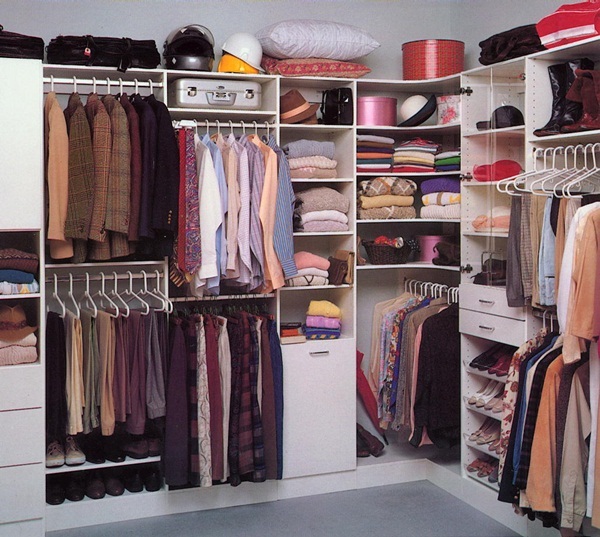 You can manage the space of your house and also the wardrobe collection of your house efficiently without any hassle. Go for walk in closet designs for your room.